The regeneration of Hartlepool has entered a further important phase as £1m of improvements are underway to a key route in and out of the town. The work – which will be completed by early September - is being carried out on Stockton Street between the Victoria Road/Church Square and Park Road junctions. The project has been devised by Hartlepool Borough Council and is funded by the Council and the Tees Valley Combined Authority. The wall that currently runs along the central reservation of Stockton Street – which creates a very visual sense of separation between the Church Square area and the rest of the town centre – is being removed and replaced with low-level landscaping which will create an open high quality environment. 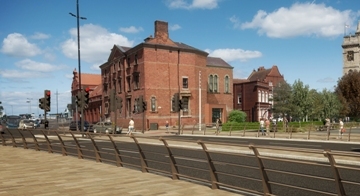 Improving the connection further, Stockton Street southbound will be altered to include right-turn entry to the Middleton Grange Shopping Centre multi storey car park – currently the only access from Stockton Street is via the northbound carriageway. The right turn will be controlled by sensor-operated traffic lights. This is designed to encourage greater usage of the car park and shopping centre. To enhance pedestrian movement between Church Square and the rest of the town centre, the current two-part pelican crossing between Church Square and Wilkinson’s corner will be replaced with a single crossing, so pedestrians will no longer be held up on a central pedestrian island between traffic light changes. As well as the central reservation landscaping, the appearance of Stockton Street will be further improved by new paving and lighting. The work started on Monday 11th March and throughout its duration a temporary one lane system will be in operation on Stockton Street both northbound and southbound, so drivers are asked to please allow extra time for journeys along this route.